Is your electric motor trying to tell you something? Plant and maintenance engineers often seem to have an intuitive nose for trouble, so are able to predict pending problems with machinery and take pre-emptive action to prevent them. It is not the result of magical powers, rather of long experience with plant and machinery. Bill Bertram of motor maker Marathon Electric explains how different motor sounds can be interpreted. If you walk around a piece of plant that is running, you will hear it making a noise. If you listen carefully you will be able to pick out individual elements within the overall sound. For instance, you may be able to hear a fan whirring, a pump thumping and a conveyor rumbling. It is not surprising then that an experienced plant engineer will be able to pick out individual electric motors and come to know their specific ‘sound signatures’. If a motor’s sound starts to change, this may be an indication of a problem, so the astute plant engineer will take the time to investigate and may thus nip a potentially major breakdown in the bud. There are two main classes of extraneous noise in motors – mechanical and electrical. The most likely mechanical causes of noise are worn bearings, moving parts rubbing together or colliding, a bent shaft, and a loose or missing screw or other minor part. The type of noise may well indicate the problem, and the relevant part of the motor can be inspected and repaired if necessary. The most likely electrical causes of noise are the loss of one of the three phases leading to a phase imbalance (three-phase motors only), or harmonics caused by the use of an inverter. Again, the character of the noise may suggest the problem; the solution may be simple, but could also be a bit more complicated. Motor sound signature analysis is in fact a highly developed field of study, but it is generally only viable to apply in very special situations, such as the main drive motor on a nuclear submarine and the enormous pumping motors used in deep shaft mines. 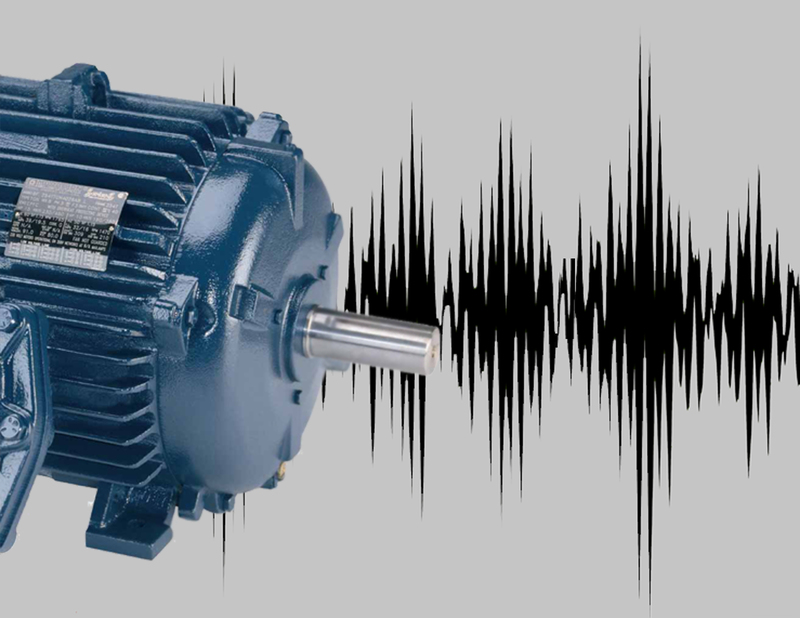 In major industrial applications, such as power stations, the similar discipline of vibration analysis is sometimes used as a way of monitoring the ‘health’ of large motors. But in most cases motor noise is assessed intuitively by engineers familiar with the plant on a day-to-day basis. Common causes of damage to a motor include physical impact, electrical or mechanical overload and poor maintenance. Probably the most common of all is a blow that damages the relatively fragile fan cover and causes it to impact the fan. While damage to the cover will be immediately apparent, a fan blade may also be broken or bent or the fan’s mounting or shaft may suffer. A simple visual inspection will show all of these problems apart from a slight bend in the shaft, which will probably lead to a whirring or humming noise in operation. A larger impact could bend the main shaft, damage the bearings, dislodge a minor part or even damage the casing. Most of these could involve a major repair or even require the scrapping of the motor. The motor’s central drive shaft can also be bent if it is subject to excessive load: perhaps a crane trying to lift an overly heavy object or a conveyor motor continuing to run even though there is a physical blockage on the conveyor. It is worth noting that drive shafts often experience their load as being asymmetric, i.e. they are subject to a constant bending moment. A slightly misaligned or bent motor shaft will produce a humming sound. A similar noise can be created if there is a minor fault in the transmission equipment attached to the motor shaft. The latter can be confirmed by disconnecting the motor shaft from the load and turning it on. If the noise disappears, the fault is not in the motor. If the noise is still present, there is a second test to do. Turn the motor on, then off; if the motor stops turning instantly, the problem is almost definitely electrical, not mechanical. A burning smell or carbon deposits indicate a failed connection, which may be easily repaired. It is possible that one of the coils of the rotor has failed (become unwound or disconnected), causing the electromagnetic field to become asymmetric and creating rotor wobble. If one of the coils feels loosely packed, a rewind is probably required. Rewinds will nearly always need to be undertaken by a professional, as will replacement of damaged shafts and worn bearings. Many other repairs could be completed in-house, although it may make more sense economically to simply replace the motor. It is increasingly common to use a motor in conjunction with an inverter or variable-speed drive. A drive can be used to reduce energy consumption by running the motor at a slower speed (energy savings are often very considerable), or to provide an extra level of operational control (for instance a motor driving a centrifuge could be set up to have three set speeds, two rates of acceleration and two rates of deceleration). However, it should be noted that an inverter may increase both the electrical and mechanical stresses in a motor, so increased maintenance and monitoring could be required. Industrial electric motors are robust and reliable pieces of equipment, which require remarkably little maintenance during their working lives. There are many, many examples of a motor giving sterling service for literally decades, especially if they are regularly inspected and minor problems are addressed promptly. Maintenance generally consists of cleaning, lubricating, checking the mountings and load alignments, checking the running temperature (and ensuring free air circulation), listening/feeling for vibrations and checking electrical connections. Common minor repairs may include tightening screws and bolts, redoing electrical connections and fitting a new cooling fan and/or cowl. Larger repairs include replacing worn bearings and rewinding coils, which may be better done by a specialist contractor. One of the best ways to check on a motor is to get to know its sound signature and to listen to it regularly. It is not only a simple thing to do, but it becomes almost intuitive to a dedicated plant engineer, and it is probably the best early warning system available! Really this is looking nice and very powerful. My Riccar Vacuum runs well and I don’t notice any problems. It is about 5 years old and recently began to whine upon cutting the power. It didn’t seem to do this previously. It is a gradually deceleration and a gradual decline in the whirling sound, otherwise everything seems ok. Should I be concerned? My TEFC, 3ph., 50 HP Squirrel cage induction motor is coupled to a air compressor. When the load is about 20 % there is intermittent metallic knocking from the fan side, current in all the three phases is equal. But this noise greatly reduces when load is increased to more than 50 % . Motor is not getting excessively heated and it appears to be normal except for this problem. Request your comments/guidance in the matter. I have 20 hp siemens company motor and it stopped with a whistle like sound while it working. So what can i do to check the motor may it ok or burn…. I have an electric scooter lift in my Van. It has 2 motors.One to lift and the other to move in and out. While lifting my scooter the “IN ” motor made noise like a machine gun. ???? Our company Sky General Co would like to cooperate with your decent company. So if you are able to provide thesebelow items please send us your kind offer. we are a Publishing House dealing in the mechanical and power transmission field. We are not producer or distributor of parts and components. We manufacture Air Compressors. We are looking for a device that can recognize whether the machine is performing properly or no based on the noise it produces. In the sense, Anomaly detection in sound to detect a faulty equipment. And we are trying to quantify the sound produced by the machine.